Fine hand-painted china is very rare nowadays. The age-old craft has been replaced by mass production. 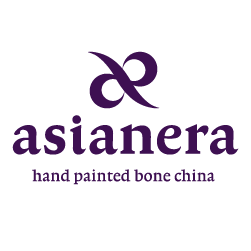 Asianera believes in the importance of preserving this dying craft, and we feel lucky to be able to find and train talented artists who believe in the same thing. Each Asianera piece is individually hand-painted and stamped with the artist's initials. Delicate individual brushstrokes and differences in shading, color, placement, and even in composition make each piece unique. Compare 2 or 3 pieces of the same item, you will discover minor differences in the hand-painting. No piece is exactly identical to another. It is precisely the individually of each piece which gives it value. The high-gloss sheen, fine translucence, and creamy whiteness give bone china an unparalleled look of elegance. Its thin and lightweight body is deceivingly fragile, yet it is very durable. We use the best lead-free glazes from England, Germany and Japan to ensure our products adhere to strict USFDA safety standards. Bone china contains 35-45% bone ash in the clay formula, thus the term bone china. This major part of bone china is a renewable resource. The bone ash is made from high-fired, processed, and refines cattle bones which is an animal by-product. It is the bone ash element which gives the fine bone china body its excellent translucence and durability.